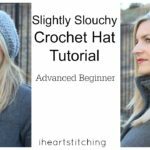 I’ve got a new crochet video tutorial for you! 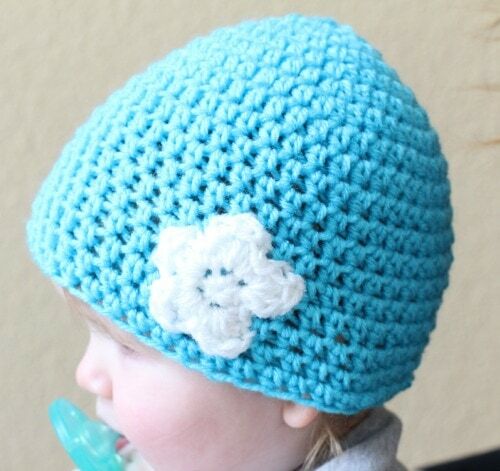 This is the toddler crochet hat beanie, but if you would like the adult sizes, you can click HERE to get the pdf! 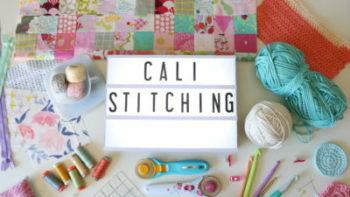 If you already have the pattern, here is a video tutorial for you to follow along if you are a newbie! 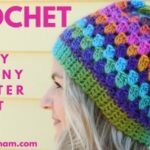 I want to continue to offer my patterns for free, so if you enjoy any of my tutorials, I invite you to share them with your crafty friends! Every little bit helps, Thank You so much! – 1 skein medium worsted weight (4). I like Vanna’s Choice, but Red Heart is good too. If you would like to add the flower, you can find the pattern for that HERE. If you need some help with the Magic Circle technique click HERE. the circle and tighten circle. Slip stitch, chain 1 and begin with Round 3. *For my 3 year old I made the hat with the women’s small size. I used the Red Heart Shimmer yarn which is finer than the worsted weight and worked up a bit smaller than the Vanna’s Choice or Red Heart, so that is why it worked for my 3 year old. The hat is 7 inches long and 8.5 inches wide at the widest point. * For my 6 year old, I used the womens small size as well and used the Red Heart with Love yarn. His hat measured 7.5 inches long and 9 inches wide. Please note, my children are very tall for their ages! 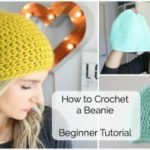 Looking for a women’s beanie video tutorial? 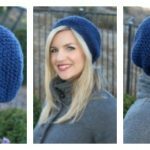 Try the slouchy beanie or the beginner beanie! This pattern was created by Melanie Ham. You may not distribute this pattern or any portions of text or photos from this pattern. You may gift and sell items made from this pattern. Please link back to my blog or YouTube Channel and give credit. Thank you! Email me with any questions – melaniekham@gmail.com. *This post contains affiliate links. 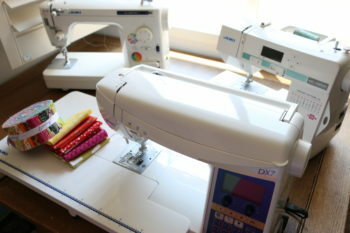 It costs nothing for you, but helps me to purchase craft supplies for videos. THANK YOU for the support! I made this heat so many times. It’s so easy . It’s great for last minute gifts. I made it in two colors, then I put a poppom on top. Too cute thank you, you taught me so much. I’m trying to make a hat for a 2yr old and it keeps coming out much to small. I’m using the lion brand baby soft yarn which is much thinner than its counterparts. I was wondering if this could be the reason why and how I could fix the hat. I’m a beginner and I followed you steps correctly and I still got it wrong for the toddler size .. It was still small by the end of round 7 more like a newborn size but I was using size hook k.. What and how did I go wrong? thank you for your easy to follow tutorial on the toddler hat. i enjoyed it. Hi Melanie! How would you adjust this hat to accomodate a different size yarn? I have a light weight yarn (3) and a super bulky weight (6) that I would like to make hats out of, if possible. Thank you! What is the best way to attach the flower to the hat itself? PS Your videos have been a great inspiration to me. I love the projects. Thanks so much for the time and effort you put in to make such a great resource available to the rest of us. 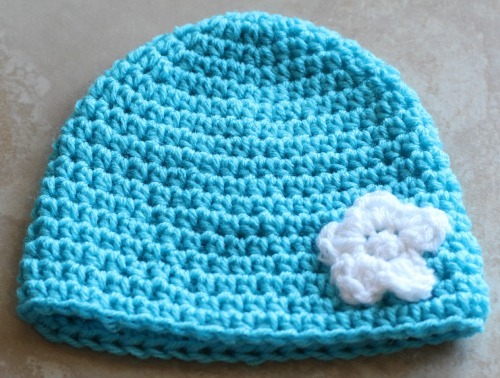 I don’t think I am over looking it anywhere as I have looked, but where is the directions to finish off the hat? In the video you say it is available on the blog. My circle is about 4 1/4 at the end of round 7, not sure if I should take it out and start over with a bigger hook or make another round? I’m new to making hats and have only done a few other projects before. I love all you videos, I am also hoping to make some key fobs for Christmas gifts.